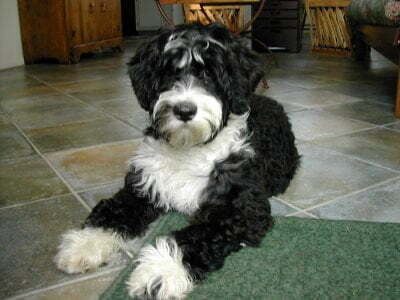 The colour of a Portuguese Water Dog is generally black with a white chest, and varying shades of brown are usual. You can also find grey or silver coats; white is the least common in a PWD. 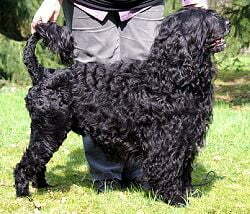 The grooming of a Portuguese Water Dog can be quite considerable and they should be clipped every 6-8 weeks or so. The fur grows more slowly than a poodle or shih tzu for example, but as an active and large dog, owners of a Portie need to keep their fur under control. The fur is a single coat and either wavy or curly. There are two acceptable clips. The one pictured here is known as the lion clip or lion cut as the fur around the top part of the body is kept clipped and the rear is shaved with the tip of the tail kept long. The more usual clip for a Portuguese Water Dog kept as a pet is the retriever clip where the whole body’s coat is kept around 1 inch long, again with the tail kept full length. If exercised properly, they require regular grooming every other day at least. As has been much publicised by the Obama’s acquisition of their Portuguese Water Dog Bo, the coat is non-shedding and as it does not shed scales from its skin, it is practically hypo-allergenic so a good choice for active families with allergies who want a medium-sized dog. The Portuguese Water Dog is an active yet hardy breed but like all dog breeds, with poor breeding has experienced some health concerns. As with many breeds, hip dysplasia has been seen in this breed so a line with a history of this should not be bred from. Like many curly haired breeds, ingrown eyelashes (distichiasis) can cause irritation but these should not be a problem if not ignored. 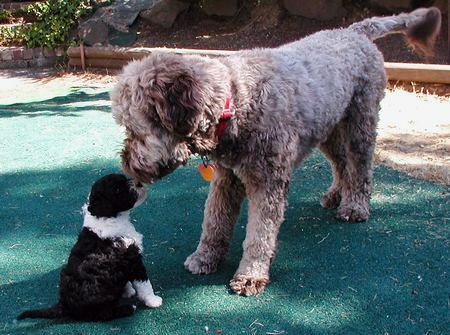 GM-1 Storage Disease is often mentioned in breed profiles of the Portuguese Water Dog. This is a nerve disease that shows around the age of six months and is fatal. Symptoms would include seizures and lesions in the retina. However, it is important to note that GM-1 Storage Disease is a recessive disorder and thanks to genetic profiling, most carriers of the gene have been identified and the disease is very rare now. 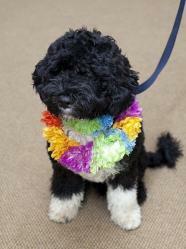 The Portuguese Water Dog as mentioned previously is generally good natured, affectionate, friendly and fun loving. They can get on with other dogs and pets, but as with all dogs, should be introduced to cats gently and as young as possible if they are to live happily together. As they are active, it is important to ensure this need is satisfied. The Portuguese Water Dog, or ‘Portie’, is certainly intelligent and eager to learn but they can be strong willed and need a consistently authoritative dog owner. Be warned the Portuguese Water Dog is not beyond taking liberties if he thinks he is stronger-willed than his owner. 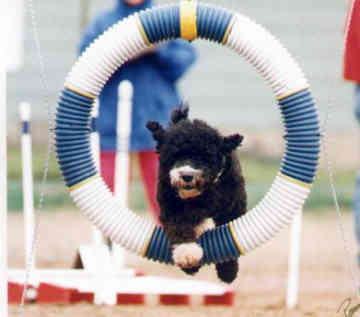 The Portuguese Water Dog is a working dog and requires daily mental and physical exercise, preferably including the occasional swim and regular retrieving work. They love nothing more than fetching a favourite ball or stick from water. On other days, a long vigorous walk will suffice. The Portuguese Water Dog loves to share activities with his family, both indoors and out, so is ideal for a growing active family or someone who enjoys walking or jogging and can spend plenty of time with their dog. Like many dog breeds, the origins of the Portuguese Water Dog breed are uncertain although it is generally accepted that the Portuguese Water Dog probably shares some ancestry with the Poodle possibly from central Asian countries initially. If this were true, it seems the lion cut has been around since the earliest days of the breed and this is reportedly where the Portuguese Water Dog was first referred to as a ‘lion dog’. Once the ancestor of this breed found its way to Portugal, the dog established itself through its love for water. As a strong swimmer, the Portie was able to dive underwater too. Portuguese fishermen used to use the PWD in a number of ways whilst fishing, whether to retrieve overboard tackle, herding fish into nets, as a lifesaver and even working as a courier from boat-to-boat or boat-to-shore. In Portuguese, the dog is known as ‘Cao de Agua’ (pronounced Kown-d’Ahgwa) meaning ‘dog of water’. In those days, the Portuguese Water Dog was highly valued and even received his own little ‘wage’, taken as part of the fishing crew’s catch. With the advent of technology, the job of the Portuguese Water Dog diminished and by the 1930s the breed became almost extinct. A wealthy Portuguese, Vasco Bensaude, took an interest in the breed and started a breeding program from several fine examples he bought from local fishermen. His most famous stud dog was Leão (1931-1942), whom he bred to so many females that reportedly around half of all Portuguese Water Dogs now could trace their lineage back to this one stud dog.